The Floral address plaque by PRO-DF is made of high quality cast aluminum. This luxurious address plaque features an embossed floral pattern. The durable powder coated paint will preserve its finish year after years even under the harshest weather conditions. Each address plaque includes a number kit, which contains 30 self-adhesive numbers, with a template for an easy installation. 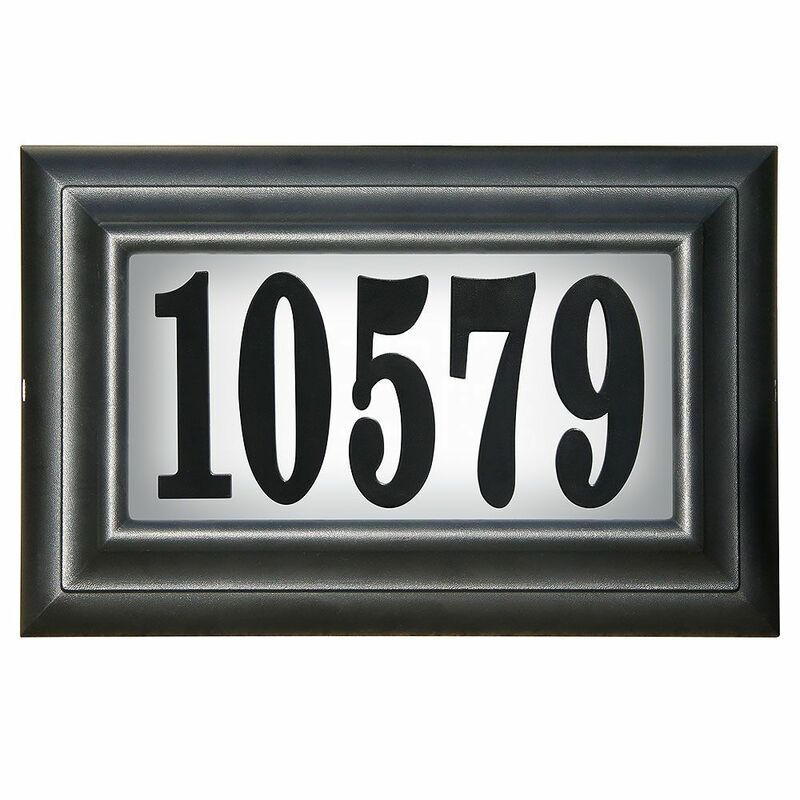 This plaque can accommodate up to 5 numbers and the mounting hardware is included. The Octagonal address plaque by PRO-DF is perfect for contractors, apartment complexes, condos, parking lots and more. Don't be fooled by it's low price, this plaque is made in Canada with resistant PVC plastic. It will preserve it's finish year after year, even under the harshest weather conditions. This address plaque will match perfectly any property styles. The head of the fixing screws are covered by 2 screw covers. (included) Accommodates up to 5 numbers (Not included / Sold separately). Classic Lighted Address Plaque, Black The Classic lighted address plaque by PRO-DF is made of weather resistant plastic with a deep bevelled frame and a rich textured surface. This plaque is designed to maximize your home's curb appeal, while keeping a lid on costs. It comes with two LED bulbs that uses less power than standard incandescent bulbs. Your address will be visible at over 100 feet away, day or night. Easy to install, it attaches to any existing doorbell systems (low Voltage). Included: 4 inches numbers, mounting hardware, two incandescent bulbs and two LED bulbs. Classic Lighted Address Plaque, Black is rated 3.0 out of 5 by 3. Rated 3 out of 5 by Chester from Looks nice! I really like this product! I had some problems with it. The first one Imreturned because it wouldn’t light up. The second one had a tiny clip broken. We used glue rather than return it again. We do like the appearance and light up feature. Just feel it could be made a little stronger! Rated 1 out of 5 by Larry from Solid plastic Don’t buy this if you intend to simply plug it in to a 110v outlet. You require a stepdown transformer (not supplied - another $20.) to make this work. The device is all plastic, so be extra careful not to overtighten mounting screws. Rated 5 out of 5 by SAM3421 from Great Address Plaque Impressed with this address plaque. Works great and easily visible from the street. Took a little work to find a adapter that was the correct voltage but works without a issue. Recommend using the LED bulbs that are included. Does this come with letters as well as numbers? The address we need to put on a plaque is 3000B. Do you have any signs with letters that will work? my address is 11410, does it come with three 1's? I don't have an existing doorbell system. Is there another way to install this light? Yes. You can use a 12 up to 18 volt adapter (wall plug in). I just used one from a old dirt devil charger. Spliced the wires at the end and hooked it up. I plugged the adapter inside and drilled a small hole to run the wire outside to the address plaque. You can also buy one from the Pro-DF company but it costs $50 ... not really worth it if you can find a phone or other appliance that uses a plug in adapter that is within the 12 to 18 volt range.